A presentation ceremony took place in the Port of Cork to celebrate the achievement of 26 young people from all backgrounds and a range of abilities across Cork City and County who completed voyages aboard the Cork-Based Vessel Spirit of Oysterhaven and the Tall Ship Pelican of London during the 2017 season. These voyages were made possible by a group of generous sponsors including Port of Cork, Cork City Council, Cork County Council, Dell, Ardmore Shipping, Enterprise System Partners, The Institute of Master Mariners and the National Maritime College of Ireland. Four trainees from the City and County crewed the Pelican from Dublin arriving in Belfast after 12 days exploring around the Irish sea. The Pelican was due to call to Cork during this voyage but unfortunately was forced to turn back due to adverse weather. Another two Cork trainees sailed from Belfast to Liverpool and on to Dublin over 10 days. These trainees formed part of groups with up-to 28 trainees and mentors on each voyage which were part funded using EU “Erasmus +” funding and involved active educational programmes of youth development as part of “Youth Exchange” projects. In addition 20 Cork based young people took part on two six day voyages on the gorgeous local vessel Spirit of Oysterhaven. These lucky trainees enjoyed the beautiful coastline scenery while sailing between Glandore and Cork. The Cork Sail Training Bursary Scheme was established in 2014 to provide access to Sail Training voyages on tall ships and large sailing vessels for young people from the region. Now in its fourth year the scheme is one of the largest and most active on the Island of Ireland and runs in parallel with similar schemes now in operation under Sail Training Ireland in Belfast, Drogheda, Dublin, Waterford, and Galway. The participants are nominated through a network of youth and community groups in Cork and places are available to young people from all backgrounds and with all abilities. The scheme has supported approximately 80 trainees since 2014 and looks likely to grow from strength to strength over the coming years. Also present on the day were trainees straight off the “Spirit of Oysterhaven” having finished their recent voyage today (day of event 1st of September), following 6 days at sea beginning in Glandore County Cork. The vessel was alongside in Port of Cork during the event and opened to visitors afterwards. “Our young people returned to us not just with new experiences but new skills, new friendships and new directions for the future.” Cork Life Centre. MC for the event was former RTE Radio “SeaScapes” Presenter Marcus Connaughton (Goodwill Ambassador for Sail Training Ireland) and the certificates were presented to trainees by Lord Mayor of Cork City Tony Fitzgerald, County Mayor Declan Hurley and Commodore Hugh Tully Flag Officer Commanding Naval Service (F.O.C.N.S.). The Naval Service is a strong supporter of Sail Training for young people as a stepping stone into maritime careers. Back in June I asked if there was sufficient joined-up thinking about the project for a new Irish tall ship – and why the Naval Service hasn’t taken a more active role in Irish sail training over the years, with advantages to itself, comparable to what the Royal Navy does in Britain…you can read that story here. The up-beat mood of the weekend’s Galway Seafest was moved several notches higher by Taoiseach Leo Varadkar, when he revealed at Galway Port that his government is broadly in favour of the concept of an all-Ireland sail training ship, which is promoted by the Atlantic Youth Trust writes W M Nixon. The recent turbulence in Irish politics had induced a mood of pessimism about any implementation of this complex project, with some of the difficulties involved being outlined recently in Afloat.ie. However, we indicated the likelihood that, if such an idealistic scheme were ever to achieve fruition, then it would most likely be through the Enda O’Coineen-inspired Atlantic Youth Trust, whose Chief Executive, the popular Neil O’Hagan, has been quietly beavering away lobbying on the project’s behalf on both side of the Irish border. For O’Hagan, the story from Galway by Lorna Siggins in the Irish Times is well-earned encouragement in his challenging quest. The Taoiseach said that sail training was “one of the areas where we could have North-South co-operation, and also very important cross-community co-operation”. He acknowledged that many people deeply regretted that the sail training brigantine Asgard II was no longer available, but indicated that his government is well aware of the €16 million cost of a replacement. Nevertheless his own enthusiasm for the concept was in evidence, and he clearly stated that discussion about the new ship “’is certainly something we can engage in”. A Tall Ship For Ireland: Is There a Lack of Joined–Up Thinking in Sail Training? Hello and you’re welcome to my weekly podcast on Afloat, based on my This Island Nation radio programme. While debate continues – and so do efforts – to get another Tall Ship for Ireland – that would provide sail training at a time when there are some people questioning whether it is worth the trouble ... and at the same time Sail Training Ireland, as the National Sail Training Organisation, provides opportunities for sail training, I had a very interesting discussion aboard a 24-metre vessel which carries out this task, was built at a cost of stg£2.6m and was launched eight years ago with a 25-year lifespan. This is the TS Jack Petchey where, through the good offices of James O’Brien who runs Monkstown Marina in Cork Harbour where the vessel was making a crew and trainees change/over, I had an interesting chat with Royal Navy Lt.Tom Forster in command. You can hear him on my Podcast below as he explained how the vessel is operated by the Sea Cadet Corps, a national youth organisation sponsored by the United Kingdom's Ministry of Defence and the Royal Navy. It is the UK’s largest naval cadet force, with over 19,500 cadets and adult volunteers. It was founded back in 1856 and also operates the Tall Ship Royalist and other vessel. Now, why does our Department of Defence and the Naval Service not have a similar involvement with sail training? Wouldn’t a sea cadet corps, with a focus on the Navy be a valuable potential recruiting source? The Irish Maritime Festival sails back into Drogheda Port this weekend (Saturday 10th and Sunday 11th June) bringing its largest ever flotilla of Tall Ships including the Russian frigate Shtandart and the Earl of Pembroke. Keen photographers can see the ships muster at the mouth of the Boyne (Maiden Tower, Mornington) at 11.30am on Friday morning, 9th June. The parade of sail will reach Drogheda’s iconic Viaduct around noon. Donor’s Green on the north strand is the ideal vantage point for photographers at this time. • The annual Boyne Swim takes place on Saturday 10th June. Starting at 12.50hrs, this challenging 2.7km tidal river swim is a hard fought contest for glory. Cheer on the 200+ swimmers as they race past the Tall Ships docked at the Maritime Festival. • Perhaps the world’s most iconic fiddle player, Steve Wickham, will officially launch Fiddle Case Pier, a new pier that will allow recreational vessels to sail up and berth on the River Boyne. • Howth Yacht Club have, once again, joined forces with Drogheda Port to stage the Howth-Drogheda Yacht challenge. Starting from Howth at 10.00hrs on Saturday, yachts are expected to arrive in Drogheda by 14.00hrs. This fun-filled race challenge is always followed by a weekend of fun and festivities for sailors visiting Drogheda. • The largest ever crew of trainees to take part in the Drogheda Sail Training Bursary. The Bursary provides valuable opportunities for young people (16 and 17 years old) from the Louth and Meath to experience sailing. Exposure to sail training opens up career and leisure opportunities for life. The award-winning festival, now in its fifth year aims to promote Maritime history and heritage in the north east. The festival also boasts a fabulous on-shore programme including live music, kids stage, food tastings and cookery demos and a whole lot more. Hosted by Louth County Council and Drogheda Port Company, the Festival is proudly sponsored by Virgin Media. Visit MaritimeFestival.ie for the full festival programme. The Irish National Sailing School (INSS) welcomed their old friends on the Tall Ship Phoenix back to Dun Laoghaire Harbour today. The Phoenix, operated by film production facility Square Sail, participated in last weekend's Dublin Port Riverfest on the River Liffey. The two–masted brig is currently along side at the West Pier in Dun Laoghaire for maintenance work to bottom timbers. INSS provide marine production faciliies in Ireland and Rumball is currently working on the TV smash–hit The Vikings, as Afloat.ie previously reported. Drogheda Port's Captain Martin Donnelly have invited a wonderful new fleet of ships to visit Drogheda for the Irish Maritime Festival 2017 on 10-11th June. “The visiting ships are the focal point of The Irish Maritime Festival and it is always wonderful to see people of all ages climbing aboard to explore these magnificent vessels. It’s so important that we offer a selection of ships each year to interest and excite our audience and this is our biggest offering of Tall Ships yet.” explains Capt. Donnelly, Harbourmaster of Drogheda Port. He was speaking this week as he unveiled the line-up of ships visiting Drogheda this year. Perhaps the most impressing of all the ships sailing into Drogheda this summer will be the “Shtandart”. Commissioned by Tsar Peter I of Russia in 1703, the modern day “Shtandart” is an exact replica. Built in 1999, this magnificent 128m long vessel carries 10 officers and 30 trainees. The elegant masts will play host to the Peter Pan aerial acrobatic show during the Irish Maritime Festival. Keep your eye out for the beautiful tall sailing ship “Maybe”, which was built in 1929, which will make a short appearance with another crew of sail trainees. This year there is a big focus on sail training at the festival with no less than three vessels carrying trainees. A special gathering and presentation is taking place at 6.00pm on Friday 9th June at Millmount Tower. Anyone interested in future voyages is welcome to attend. Find out more about each of the ships by visiting www.MaritimeFestival.ie/Ships. The Irish Maritime Festival is hosted by Louth County Council and Drogheda Port Company in association with Virgin Media. Find out more by visiting www.MaritimeFestival.ie and follow on Facebook and Twitter for competitions, news and festival updates. As we move into March each year, throughout Ireland Tall Ships enthusiasts will wistfully recall that it was in March 1981 that Ireland finally commissioned her own Tall Ship, a national flagship worthy of our aspirations, the Jack Tyrrell-designed and Arklow-built 84ft brigantine Asgard II writes W M Nixon. She gave years of excellent service and introduced young people from all backgrounds and every part of the country to the complete sail training experience at its very best. Yet although she was officially within the remit of the Department of Defence, in times of government expenditure cutbacks, the very existence of such an exotic creature in the amidst the workaday problems of running organisations with a military emphasis could be problematic. Under a succession of talented and dedicated skippers with a small but devoted permanent crew, Asgard II was run in an efficient yet distinctly non-military, non-bureaucratic way. Even if at times it was done on a shoestring, it was all kept working, appearances were kept up with the vessel maintained by the crew, and the seemingly free-style system of command, while it had a core of disciplined pure steel at its heart, worked well to create a happy ship. Nevertheless it could be argued that the unique and complex problems of running a small national sail training ship and her programme were about as far as could be from the instinctive abilities and traditional approach of the Irish Public Service mindset. But that said, the Irish public service has broad shoulders. There may not always have been total enthusiasm within it for having anything to do with running Asgard II. But it was always there in their In-tray, and they got on with it, with secretaries to Coiste an Asgard tending to give service way over and above the requirements of duty. Yet being a Government-run ship, inevitably the viewpoint of whoever was Minister for Defence at the time affected the attitude to the Asgard programme. The realities of democracy intervened. At a national level, even in coastal constituencies, few if any votes were won or lost over whether the local TD vociferously supported the Asgard II sail-training programme. And if the current Minister for Defence happened to represent an inner-city constituency with little if anything in the way of deeply-engrained maritime traditions, Asgard II was way down the list of priorities. Thanks to devoted bos’uns and crew, Asgard II was always looking her best even when age was creeping up on her. But she could be kept going – just - thanks to the ability of those running her to stretch resources to the limit and beyond. Yet with every passing season, the longterm problems were increasing. By the time she was sailing her 25th season in 2005, there were those who argued that a traditional wooden hull, with its single-skin planked construction, was no longer in compliance with increasingly complex regulations which required double-skin construction in a passenger-carrying boat, but Asgard II – with her limited number of trainees - was still able to pass regulations as a cargo-carrying vessel. Then too, in the late noughties, Asgard was looking her very best with a devoted skipper and an extremely able bo’sun. But skilled painting, word-class varnishwork, and the necessary provision of a new and highly-visible set of immaculate spars, disguised the fact that if Coiste an Asgard had been given the funds to provide a replacement hull, the latest set of regulations would have insisted that it be double-skin. That in turn would have led to a raging public debate between those who would insist that Asgard III must be built in wood, and those who would reasonably point out that a double-skin wooden hull – with a safety gap between the skins as required by regulations – would be very space-consuming in a little ship which, even in her single-skin version, was already very crowded within her hull, and thus steel or even aluminium would provide the best way to go. It all became very academic on September 8th 2008, when Asgard II sank off Belle Ile in the Bay of Biscay while on passage with a full crew of trainees from Falmouth in Cornwall towards the French port of La Rochelle. It started to happen shortly after midnight, and as she sailed along in reasonably pleasant late summer conditions, no-one on board had seemed aware of any impact with a submerged hazardous object, such as a container, which might have caused this sudden ingress of water. But it became such that the ship’s pumps couldn’t cope, and the captain’s first duty was to his trainees – it would have been irresponsible to spend precious time in the small hours of the morning calling up any ship which might happen to be in the neighbourhood, in the hope that she might have transferrable pumping systems which would have helped alleviate the problem. The seamanlike thing was to declare the ship a hulk, and arrange her abandonment in an orderly manner. The only setback which arose in this action was the collapse of the floor in one of the large liferafts – a liferaft which had only recently been re-certified – but the people on it were transferred to other liferafts, and in due course the local lifeboat arrived and took everyone to Belle Ile while Asgard sank with a certain quiet dignity, and took up a position sitting on the seabed in 84 metres of water. There were immediate calls for her salvaging as soon as possible, to be followed by full restoration and a resumption of sail training duties. But the senior officer of the Naval Service involved in the issue put it all in a harsh but necessary perspective: “Would you like your children to go to sea as trainees in a ship which has sunk in this way” he quietly asked, “when, however good the restoration, it is still the restoration of a vessel which inexplicably sank like this?”. For however much you try to read into the official report, its results are not totally conclusive, and the reality is that the Asgard II sank, and sank quite quickly, after an impact of which no-one was aware. It’s very likely the sinking would not have happened had she been double-skinned. But any attempts to make a raised and restored Asgard II into a double-skinned vessel would have been an absurd waste and misdirection of resources. Be that as it may, by this time, the Irish economy was in complete free-fall off a very high and steep economic cliff, and although the loss of the Asgard II was assuaged eventually by an insurance payout of €3.8 million, it was only within the sail training community that anyone protested against the transfer of these funds to the Department of Finance at a time when the national economy was on its knees with the Troika bail-out. In fact, the Government – for the time being at any rate – was quietly exiting the sail training arena, and in 2011 all the remaining assets and functions of Coiste an Asgard were transferred to a new non-Governmental organisation, Sail Training Ireland, which set to work to find berths for Irish trainees on other ships in an international network which, partly thanks to the very favourable reputation which Asgard II had established for herself during her 28 busy years, has been working well as they’ve also brought in “private enterprise” training ships such as Oliver Hart’s yacht-like 70ft schooner Spirit of Oysterhaven, which has been awarded the Sail Training International Small Vessel Award for 2016, a really notable achievement in a crowded field. Kate Hart, Sinead Hurley and Gary Davis of Spirit of Oysterhaven. Winner of Sail Training International Small Vessel Award for 2016. While sail training should be mainly about sailing, from time to time the vessels involved have to manoeuvre under power in very small harbours. Spirit of Oyserhaven’s lines are of special interest, as they reveal the designer has retained a straight leading edge on the rudder, thereby optimising the control benefit of propeller thrust even though the propeller is in an aperture in the long-keel hull. But inevitably a couple of years after the loss of Asgard, when her complete demise was finally accepted, voices were being raised in support of returning some day to the position of Ireland having her own sail training ship. It has to be said that these were for many years just a few voices crying in a wilderness, for in the near decade since Asgard II sank, Ireland has been a complete disaster area for tall ships and sail training vessels. The litany of disaster is unbelievable. The only redeeming feature is that in a great tapestry of sinkings and groundings and the striking of rocks, not one life has been lost. But many dreams and careers have been utterly destroyed. Appropriately, we’d had a rehearsal on RTE way back in 2003, when the traditional gaff schooner Carrie involved in the reality TV series Cabin Fever managed to come ashore on Tory Island, and soon broke up for the delectation of millions of viewers worldwide, with the whole sorry episode being on a loop on the screen in many a harbourside bar. Then, even before the Asgard II story had been laid to rest, in 2010 the Northern Ireland Sail Training ship, the 80ft Oyster ketch Lord Rank, managed to impale herself on a rock northwest of Ballycastle in Rathlin Sound on the Antrim coast. Once again the incident got even more publicity than would have normally been expected, as they had a team from Downtown Radio on board to transmit a broadcast. But a Bermudan rigged ketch on an isolated rock doesn’t make for nearly as spectacular a wreck as a proper Tall Ship destroying herself in against a cliff, and this epic was provided in 2013 when it was demonstrated that the road to hell is paved with good intentions. Ireland was barely getting her nose above water after the bail-out, and in order to get things moving again on the tourism front – for who would want to be a tourist in a country in the depths of economic and psychological depression? – the Department for Tourism set up 2013 to be the Year of the Gathering, when people of Irish descent worldwide would be encouraged to return home for holidays in the Old Sod, the land of their ancestors. Whether it was a bright idea or not is neither here nor there, as funds were lapped-up in order to pay for “Gatherings” such as family weddings. But the fact is that generally it was announced with little enough time to spare for anyone, other than those catering for people who make last-minute short-break holiday decisions, to make proper plans. Thus with only months to go, the Irish Sailing Association co-opted the Cruising Association of Ireland to put together a Gathering Cruise for visitors from Dublin Bay to West Cork, and while it attracted a turnout, the mood became more optimistic as they proceeded along the south coast, as it was learned that at Oysterhaven the little fleet would be joined by the 137ft Dutch Tall Ship Astrid, which at a stroke would maybe double the number of people taking part. But the Irish weather and the fates in general would not let you get away with such a serendipitous turn of events. Following the Oysterhaven meet, the fleet were to parade round to Kinsale. But it was a dirty day of an onshore wind, and the old Astrid would need the help of her small auxiliary engine if she was going to make a suitably impressive entrance to Kinsale close by the cliffs. Unfortunately, at a port of call earlier in her voyage from the Netherlands, Astrid had mistakenly had some fresh water put into her diesel tank. Though every effort had been made to remove it, the fuel was still contaminated and the engine cut out at the absolute crucial moment of rounding the headland immediately east of Kinsale. All hope gone. Astrid’s death throes. Unlike the Asgard II’s graceful departure, poor old Astrid had a long and lingering death in against those cliffs. It was a salutary lesson for everyone, for until then we’d tended to look to the Dutch as the very exemplars of a properly-run, indeed closely-regulated maritime nation. Yet it emerged that neither Astrid nor some of those involved in running her were properly certified to be taking trainees to sea. We’re always told that we in Ireland are too lax in implementing European maritime law, working on the old Chinese saying that the mountains are very high, and the Emperor is far away. Admittedly, apart from Snowdonia in Wales, there are no mountains between Ireland and Brussels. But even so, things seem to be the other way round in any case – the nearer you get to the entre of power, the more relaxed is the observation of “petty” regulations. In 2013 I’d already seen a demonstration of this when a large Dutch contingent arrived in Dublin as part of the Old Gaffers Association Golden Jubilee Cruise in Company. When we were in Dublin port, up the river came a Dutch character boat captain and his little dog in their tiny dinghy, and a classic Seagull outboard on the stern spluttering all sorts of pollution at a time when everyone else in Europe seemed obsessed with the compliance of regulations about changing to much heavier pollution-reducing four strokes, or making the big move to electric outboards. So all is not as it seems at the heart of Europe. And after the Astrid disaster those who might have though of using the highly-regarded Dutch marine industry as the source of a new vessel had to undertake further research until they were once again certain it was still the right thing to do. But equally, after the loss of the Carrie, the Asgard II, the Lord Rank, and the Astrid, and after it had emerged that it was simply too costly to keep the Jeannie Johnston in Dublin and the Dunbrody in New Ross in certified condition as seagoing tall ships, instead of just using them as permanently-berthed visitor attractions, there inevitably has emerged a quiet but real body of opinion which reckons that Ireland having the luxury her own sail training tall ship simply isn’t worth the hassle. The Dutch ship Morgenster. Should we continue to send her a regular supply of trainees to save ourselves the trouble of running our own tall ship? After all, Sail Training Ireland – now with Darragh Sheridan as CEO after Michael Byrne has moved on to fresh fields after several successful years – is running very smoothly in placing trainees in other European ships, with the Dutch vessel Morgenster in particular proving so popular that she is now almost honorary Irish. As the STI programme has developed, well-wishers and organisations such as the Irish Cruising Club are finding it an attractive propositions to provide bursaries for young people to go to sea in a proper international tall ships situation through the STI’s current setup. It’s neat, tidy and manageable. And when winter comes, it’s not our concern whether or not the Morgenstern, and other ships that we in Ireland use, such as the splendid Europa, have to undergo a major refit or instead get themselves out to the Canaries for a profitable winter programme. Thus as ever it was heartening to attend STI’s annual awards ceremony in Dublin’s Mansion House, and share the enthusiasm of an enormous diversity of young people each of whom had responded in their own favourable way to the Tall Ships experience. All the award winners at this year’s Sail Training Ireland ceremony in the Mansion House. STI Trainee of the Year Ross Moore (right) with (left to right) Sara Mason, Daragh Sheridan, Commodore Hugh Tully, and Cllr Ruairi McGinley. But then you couldn’t help but notice that in the Mansion House a popular guest, to whom everyone seemed to relate, was Neil O’Hagan, of the Enda O’Coineen-inspired Irish Atlantic Youth Trust. Their purpose is the creation of an all-island Irish Sail Training Ship, a 140ft three-masted barquentine based on the proven Spirit of New Zealand, and built in steel in the Netherlands by reputable designers and builders, while keeping open the option of having her builders provide a kit which can then be assembled here to become a ship built in Ireland. To work, the project would need a considerable level of Governmental input and in Ireland’s always fluid yet somehow also rigid political situation, that is the Great Unknown. The Atlantic Youth Trust has offices in Dublin and Belfast to deal directly with Government even if the island’s real maritime capital is Cork, but resolving that will be another day’s work. As it is, thanks to the influence of leaders such as Chairman Lord Glentoran, the Atlantic Youth Trust arranged a meeting with Peter Robinson MLA, the then First Minister of Northern Ireland. A Tall Ships gathering was shaping up in Belfast (when it happened, it was a notable success) so the mood was good for the delegation, and the First Minister warmly received the idea of a concept which would inevitably involve Government capital expenditure. And then he made one request. He asked them to go along the corridor and put the idea to Deputy First Minister Martin McGuinness MLA, as that was the way shared power was meant to work. So along they went in some trepidation, and after the usual introductory pleasantries, they outlined the situation and were almost bowled over by Martin McGuinness’s enthusiasm. Eventually, when they were taking their leave, they asked him why he had leapt at the idea so keenly. He replied that apart from it being a very good idea, it was maybe the first clearcut occasion on which the First Minister had received a proposal, and then without the usually inevitable closeting with his special advisors, had immediately given it a fair wind along to the Deputy Minister. It was how power-sharing was meant to work, but very rarely did. It was a good start, but there was still a long way to go, for in tandem with their negotiations in the north they had to bring the Dublin government in as an equal partner. Here, the overall response was favourable but the complexities – involving a different structure of Government departments, not to mention all the movements in political mood - made it long hard going. Meanwhile, there was a by-product which bears out the effect they’d had in the corridors of power in Stormont. Our northern correspondent Betty Armsrong was in Derry for the visit of the Clipper Fleet, in which the city had an entry, and came back enthusing about her new VBF Martin. It turned that while in the Maiden City, she’d spent some time in the company of Martin McGuinness whose enthusiasm for the entire waterborne pageant was total. “Admittedly” said he “the cost of supporting the boat and getting the visit seemed very high when we were being talked into this, but now that it is happening so well, it’s worth every penny”. It would be ironic if the successful visit of the Atlantic Youth Trust to the office of the Deputy First Minister is in the end only recalled for the fact that Martin McGuinness was an increasingly enthusiastic supporter of major maritime events and projects. But the reality in Government is that the political personnel landscape is now entirely changed both north and south, and we’ll need the dust to settle before we can see where it’s all going. Yet even as recently as November, Neil O’Hagan reckoned things were looking good, and he’s convinced they’ll come good again in due course. Back in November, despite the turbulence of Brexit, he was getting various government departments north and south and the STI and other bodies nicely lined up for a series of test programmes using the Morgenstern, and then anticipated building on that. A plateau of achievement had been reached, and former Olympic Gold Medallist Lord Glentoran, a visionary chairman but now well into his eighties, felt the time was right to step down and be replaced by noted businessman and experienced sailor Peter Cooke. Atlantic Youth Trust in Belfast with (left to right) Neil O’Hagan, Lord Mayor of Belfast Brian Kingston, incoming AYT chairman Peter Cooke, President Enda O’Coineen, and outgoing chairman Lord Glentoran. But since November, other things have happened. The collapse of the Stormont administration and the General Election last Thursday will have its effect. So will the possible changes of leadership south of the border. And while Enda O Coineen now has a largely honorary role in the Atlantic Youth Trust as President, public perception is so febrile that we can only guess at the effects – favourable or otherwise – his major setbacks and his courageous handling of them in the Vendee Globe race will have on the way people view the Atlantic Youth Trust. Thus for the moment there’s a distinct vacuum where positive progress towards a joint-government-underwritten sail training ship for all Ireland might normally be found, and all too quickly, vacuums being what they are, all sorts of alternative solutions may be offered. The trouble is that, when faced with a big traditional sailing ship and better still a square rigger - any square rigger, and preferably one with a magnificent clipper bow – people will lose the run of themselves in dreams. Dreams of sailing the seas as the great mariners of yore did before them. Dreams of introducing young people to the wonders of sail. Dreams of saving the planet through the healing effects of majestic rigs driving non-polluting tall ships cross the ocean. Such dreams are getting thing entirely the wrong way round. Certainly you may be inspired by seeing a ship like the Europa making her handsome way down Befast Lough under full sail. But having seen her, that’s when the research work should start, the hard work behind the scenes to make it all a realistic proposition, and start working towards sustainable funding. Yet it so easy to see the ship and get inspired and immediately involved without a thought for what it will cost in the long run. That’s probably how the elderly owner of the Astrid was drawn into the dreadful mesh. And in the north, they’ve two character ship ventures whose owners dream the dream, but whether either can ever become reality is another matter entirely. There’s a vessel called the Silvery Light in Newry, and she inspired those who saw her when she first arrived in Ireland alongside the quay in Carlingford. 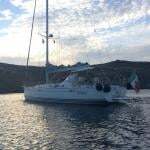 But now the owner seeks support from whatever source to make her fit to be a sail training vessel – we can only wait and see, for we have some idea of what a monumental task this is. But in the little village of Portaferry, a tall ship dream has turned into disaster. We’ve carried stories of the sunken 130ft Regina Caelis on Afloat.ie in recent weeks, but things get no better. 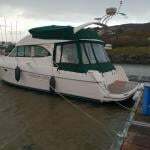 Apparently she is owned by someone who bought her from a previous owner for just £1.The previous owner from Northern Ireland had bought her in Scotland, hoping to turn her into a tall ships dream to sail in warmer seas. But by the time he’d got her home to County Down, he realised it was beyond his ability to complete the work, so after he’d managed with great difficulty to get her berthed on the end of the little public quay at the south end of Portaferry, she was offered for sale for the nominal sum. That was more than a year ago. Since then she has changed ownership for £1, but she continued to completely block off what should be an important local amenity, as Cook Street Quay – to give it its local name – traditionally provides free berthing, but its successful functioning depends on no-one abusing this valuable privilege. Whatever about the good intentions when this ship the Regina Caelis arrived at the quay, berthed on it she is so out of scale that her bow sticks out at one end and her stern sticks out at the other, thereby impeding boat access to either side of a public pier. Staying there for more than a year soon became a matter of abusing a communal facility. But then it all became completely pear-shaped when she sank at the pier, gradually leaching 900 litres of diesel fuel into Strangford Lough, a very special nature reserve. It’s now an environmental and neighbourhood disaster beyond belief. But with a free pier and in the absence of an active government, the position has been allowed to persist, while the optimistic owner has launched a crowd-funding initiative in order to raise his vessel and restore her to her full potential as a tall ship. Seasoned observers reckon that it will indeed be a crowd-funding initiative which will solve the acute problem of the Regina Caelis slowly disintegrating at Cook Street Quay in Portaferry. But the crowd will be the much-put-upon taxpayers of Northern Ireland, and they’ll be in this crowd-funding project whether they want to or not. Whatever the outcome, it’s all a very long way indeed from a properly researched and resourced sail training barquentine for the young people of all Ireland. And in its veiled hostility, it’s all an extremely long way away from the friendly efficiency of the annual Portaferry Sails and Sound music and traditional boat festival, which shows Portaferry at its best. In every way, it’s an excruciatingly unpleasant situation for a charming village. Portaferry deserves better. Afloat.ie has received an 'urgent' appeal for Tall Ship enthusiasts to help with a sunken 100–foot schooner in Portaferry Harbour. William Mulhall says he wants to return the 1935–built vessel to her 'former glory' but is seeking the assistance of a 'Tall Ship enthusiast to raise her and give her a refit'. As Afloat.ie previously reported the schooner contained up to 1,000 litres of diesel fuel and had been moored in the harbour for some time, up to 18 months according to local reports. BBC news says although a diesel spill in the area will clear up relatively quickly, the salvage operation to move the Regina Caelis could take months. It is understood specialist equipment that is capable of bearing the weight of the boat, which is more than 200 tonnes, will need to be brought in. The Schooner Regina Caelis built in 1935 is 108ft long with a 40ft bow sprit and 10 sails, she has 3 masts and an engine BMA fitted in 1955. I urgently need a Tall Ship enthusiast to raise her and give her a refit on slip and return her to former glory. I am open to ideas, partners, groups and shares'. The Norwegian tall ship, Christian Radich, one year short of its 80th anniversary, made a fine sight in Cork city last night. The 1937 built ship is berthed at the North Custom House Quay. As Afloat.ie previously reported, the visit to Cork Harbour is private and will run beyond the weekend to at least mid-week. This it to facilitate trainees who are to attend a maritime course. Christian Radich is one of two of Norway’s most famous large tallships, the other ship been Statsraad Lehmkuhl dating to 1914. The square-rigger in August made a visit to Dublin as part of National Heritage Week.